Froggy's Fiber Followings: Who's afraid of Batts? On the left is Spring Green. ( I just made that up as I wrote it.) 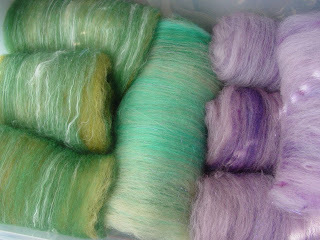 It is pre-dyed fiber I bought from Wild Fibre in Savannah. It's layered with dark green, yellow and a lighter, celery green. It also has bombyx silk and glitz. I used a rhyme and reasoning to make the green outer layers that were blended with silk and glitz. The yellow was an inner layer that was carded with silk and the lighter, celery green was carded with glitz. The last batts will be called "Boysenberry." They are a combination of purple roving (wool I assume) that I bought from someone a couple of years back and Coopworth locks that I combed to open up before carding. The Coopworth was purchased at SAFF and was a nice purple and purplish-blue. These also included tons of purple glitz. Sort of mono-toned but not really. I really enjoyed drum carding this weekend but it took a little time to get the rhythm going. I'm hoping to get more carding or some fiber dying done this upcoming weekend.